To fundraise for charities. My first hand-written cookbook I sold to raise money for the Christchurch Earthquake Relief Fund, and then I hand-wrote two books to raise money for the True Colours Charitable Trust in Hamilton. 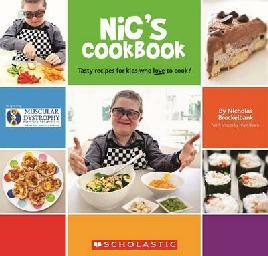 “Nic’s Cookbook”, which has been published by Scholastic is raising money for the NZ Muscular Dystrophy Association. The great experiences I have had, like meeting Simon Gault and Brett McGregor and going on “What Now” to do a cooking demonstration. Taste of a Traveller, by Brett McGregor. The great people that live here. And luging in Rotorua. They are quiet and full of books. Nic wrote Nic’s Cookbook, which was published last year by Scholastic, when Nic was ten years old. You can check out www.nicocool.com and www.facebook.com/nicscookbook for details about Nic and his cookbook. Throughout NZ Book Month we’ll be posting lots of mini interviews with New Zealand authors and illustrators. Our first Fast Five is with David Hill. Became an author partly because i wasn’t much good at anything else. Also because I liked telling jokes and stories to people and making them laugh and listen. Also (No 2) because when our kids were born, I thought they were so special that I wanted the whole world to know about them – so i started writing stories about them for adults. When you write a story / poem/ review, you’ve made something that never existed in the world before. It’s an amazing feeling, and it’s one of the special pleasures of being an author. I’m a great fan of any of Maurice Gee’s books. I love the ways he mixes reality and fantasy. He turns our world into something strange and fascinating. I like the light of NZ. It’s bright and clear and very special. I also like the fact that so many of our museums, libraries, art galleries, places like that are FREE! It doesn’t happen in many other countries. Libraries are gyms for the mind and the imagination. You read books; your mind becomes fitter and more active. You go on trips that people who don’t read will never experience. Books provide you with this. Libraries provide you with those books! David Hill is the author of See Ya Simon, Aim High, Journey to Tangiwai, and My Brother’s War. My golly, it was amazing! Thank you so much for organising the interview with Derek for me. Also big thanks to Harper Collins and The Children’s Bookshop. It was the best day of my life meeting him in the bookshop. I am ever thankful! So, my interview was very long but very interesting. I had to transcribe the whole thing but here it is! Me: What was your inspiration to write? Derek: Wow, what a first question. Ho, I don’t know because I was always a writer, because when I was a kid, always writing. It kind of just bled into my teenage years, always writing, and my twenties. I taught myself to read by reading comics. Anything that told a story I loved and basically, if you are a writer, you reckon you might be a writer then you are a writer. It’s not something that occurs to you when you’re 27. It’s a burning passion. Me:How did you come up with ideas? Derek: The titles are a cross between being really simple and really, really difficult. Like Skulduggery Pleasant, the first book, just nice and easy. The Faceless Ones I knew starting out that it would be called that because that’s what the story’s about. Dark Days was kind of tricky, that took me a while. Mortal Coil, well I knew instantly and Death Bringer, again it’s about the Deathbringer. Kingdom of the Wicked, this occurred to me about a few weeks into writing it and the only title that, I’m not happy with is Play with Fire, which was originally called Praising Cain and that’s what I wanted it to be called but the American publishers were worried that it was too much of a biblical reference. They didn’t want to annoy any religious people, so they said can we not call it Praising Cain and I said but that’s what it’s called. I didn’t like their title; they didn’t like mine so I just said Playing with Fire. And Oh! We love that! And I mean yeah, it was ok. So if I could go back I would change only one title and that was Playing with Fire. Me: What are the joys of writing? Derek: The fact that, I don’t have a boss. Because that’s a big thing. So no one could tell me what to do. But writing it’s also the only thing I can do. I was incapable of doing anything seriously, I’m not a serious person and I’m not a highly responsible person either. So, I’m just living for myself because just like all writers are self-centered because we have to be, we have to ignore people and just live in our heads which suits me fine because I hat people, they’re weird and they talk funny! And I’ve got my cats and dogs and I can understand them, I can understand animals and the fans who are a certain type of animal themselves. Me:What character is most like yourself? Derek: Well, Skulduggery is like me. He’s charming, witty smart, suave, debonair, dangerous, unpredictable, cool and yes narcissi. A lot of people ask am I like Gordon. And no, I’m not like Gordon, I mean Gordon’s like an uncle, a doddery old uncle, and especially because when I started the first one I had no intention of having a char like Gordon but it’s not that when I started writing I became more like him, he has become more like me as he’s gotten older. Me: Any tips for young writers? Derek: This is one piece of advice I give to everyone who asks me this. If you knock me off the bestseller charts I will hunt you down and kill you with a spoon. That’s my one tip and other pieces of advice include ignore everyone, literally ignore everyone else. You write what you want to write. When I wrote Skulduggery Pleasant I didn’t have a contract I wasn’t paid I didn’t have anything and because of that I just put in anything really, monsters, murder mystery, and there’s fights, there’s comedy there’s this, this and this. If I had looked around at books that are all pretty out there I wouldn’t go oh no I can’t do this because nobody’s done it before so I can’t do it. I just wrote what I wanted to write. And what I wanted was to put everything into one. So that’s what I did. Basically, you write what you want to write and forget about everyone else. Me: At Age 12, where did you see yourself? Oh! I see, I see, what I saw myself doing in the future. Writing. Either that or an artist because I wanted to work with comics but I wasn’t that good of an artist, I got kicked out of art college, but writing was the one thing that stayed with me. Me: Was there any other purpose of Skulduggery Pleasant other than entertain and amaze? Derek: No, I didn’t write it as any type of career move, I didn’t write it to educate or teach valuable lessons. I’m not concerned about things like that but there is no message. The only possible message that could be derived from it is how to be a good person. Because Valkyrie is based on a real person and I think she is a decent person and so Valkyrie and Skulduggery behave how I reckon people should behave. So it’s just to be a good person, to be strong and honourable, stick up for a little guy no matter what. That’s my message. I’m just trying to make the world a better place! Me: What’s the best thing about writing? Derek: That fact that, you get to do as a career what you would be doing as a hobby. That put simply. Derek: Because I the first book, I was going to kill her off, but my agent told me I couldn’t do that so we made a deal, I said Ok we’ll keep her, but so long as I can torture her in every book since. So, she’s been shot, stabbed, thrown off a building, she’s been nailed to a chair. And really, being possessed is just an extension of that, it’s the logical conclusion. And I have the right to kill her in the last book if I want to. Me: Would you consider making Skulduggery Pleasant into a movie? Derek: I would consider it, it was with Warner Brothers then the writers wrote back and we’re working on the script with some great people, but I cannot guarantee that a movie will be made and that, if it is made that’ll be any good. And as for who would play Valkyrie and Skulduggery, just an open audition for Valkyrie, around the world. And personally, I think I should play Skulduggery. Just motion capture me, CG, personally, I think I should play all the part. Skulduggery, Valkyrie, I could play the furniture, the trees. Just, they can do amazing things with computers. Me: Are you going to write another series? Derek: Yes, now, I don’t know what it’ll be. The Skulduggery books: There’ll be nine books in all, and then many people’s lives will be over and end in sorrow but after that I don’t know. I will obviously continue to write but whatever my next series will be it is going to have to tick all the boxes that Skulduggery Pleasant did so it’s going to have the horror, the action, the fantasy, the fun. Characters that speak really fast and annoy people. So I don’t know what it is yet but when I write it, it’ll be bloody brilliant. Derek Landy hits New Zealand this week! If you’re a huge Skulduggery Pleasant fan like me you’ll be itching to meet Derek when he comes to Christchurch on Friday. You can meet him at The Children’s Bookshop this Friday (10 August) at 4:30pm. How do you come up with your names? Was Skulduggery’s sidekick always going to be a girl? What specific books, movies and music inspire you? Would you consider making a Skulduggery Pleasant movie? 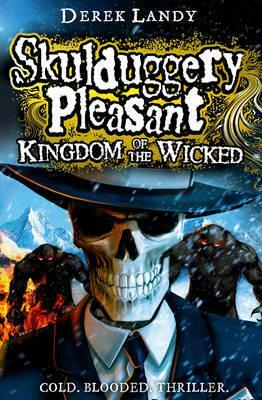 The latest Skulduggery Pleasant book, Kingdom of the Wicked is out now. You can reserve your copy at the library. 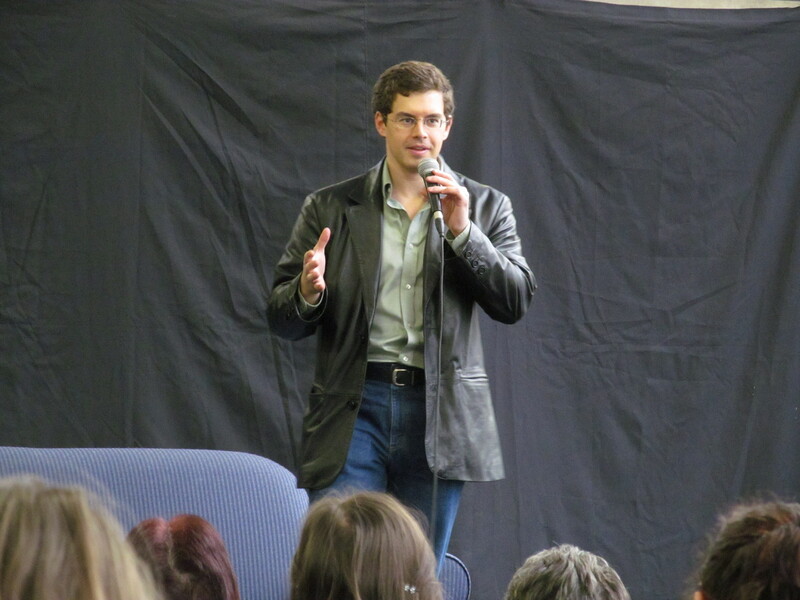 Christopher Paolini, the author of the Inheritance Cycle, came down to Christchurch at the weekend for the Armageddon Expo. Along with hundreds of other fans, I went along to listen to Christopher talk about his books and get some copies of his books signed. I caught up with Christopher to ask him a few questions about his books and writing. Boredom, mainly, and the desire to have adventures myself. Growing up, I never wanted to be a writer. No, I wanted to be flying dragons and fighting monsters! But since I couldn’t do that, and since I had a lot of time on my hands after I graduated from high school at fifteen (I was homeschooled my whole life), I decided to write my daydreams down. 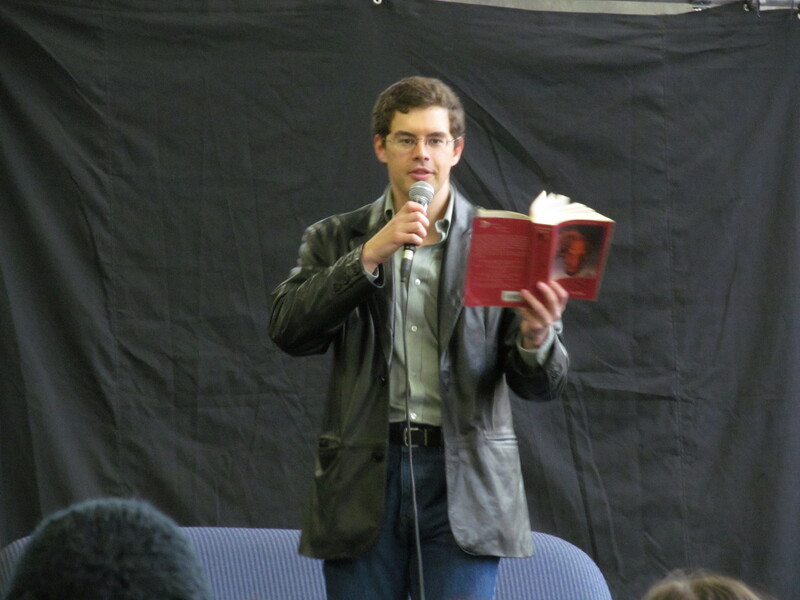 Fortunately for me, enough people around the world have enjoyed reading them that I get to tell stories for a living. How do you keep track of all the different characters within the world of your books. With lots and lots and lots of files. I didn’t used to do that when I started Eragon, but very quickly I found myself with so many characters, I couldn’t keep track of all of them in my head. So I started writing them down in a file, along with all of the words of my invented languages, timelines, and so on. It can be a bit tedious, but in the long run, it saves a lot of effort. How did it feel to get your story published when you were so young? Well, it was gratifying to know that people actually wanted to read something that I had written. And it was really neat to see my books shelved in the library and bookstores just like all of the books I had read growing up. But at the same time, it was a strange experience to go from a rather rural upbringing in Montana to traveling all around the world and talking to thousands of people at a time. Writing and publishing these books changed my life completely, and again, I’m grateful for the opportunities they have given me. The Inheritance Cycle has been a huge phenomenon. Do you feel any pressure from your fans to write something just as amazing, or even better, next? Not really. I like to think that whatever I write next will be better than what I’ve written before (I’ve learned a lot from each book, after all), but either way, I’m happy with what I accomplished with the Inheritance cycle, and it won’t bother me if my future books aren’t as popular. 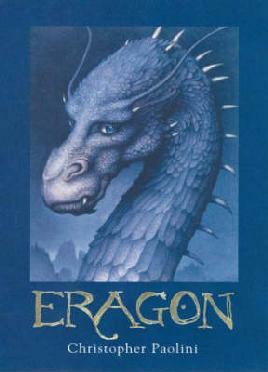 When I started Eragon, I was just trying to write the sort of story that I wanted to read myself. Moving forward, that’s all I can hope to do. I can’t write to please others, only myself. How did you find the experience of your book being made into a film? Strange and surreal! I’m glad that the movie was made—very few books are ever adapted into films, after all—and I gave as much input as I could into the process, but ultimately, the movie reflects the director’s and the studio’s vision of the story, even as the books reflect mine. Hopefully we’ll get some more movies in the future, though. What books would you suggest for anyone that loves the Inheritance cycle? Dune by Frank Herbert, Magician and sequels by Raymond E. Feist; A Wizard of Earthsea and the first two sequels by Ursula K. Le Guin; the Belgariad, the Mallorian, and the Elenium by David Eddings; Memory, Sorrow, and Thorn, by Tad Williams; the Gormenghast trilogy by Mervyn Peake; The Worm Ouroboros by E. R. Eddison; the Dragonriders of Pern series by Anne McCaffery; the Pit Dragon trilogy by Jane Yolen, the Redwall series by Brian Jacques; Fablehaven and sequels by Brandon Mull; and many, many more. Because I didn’t have anything else to do at the time, and because I’ve always enjoyed creating things with my hands, whether it was knives, swords, drawings, chain mail, or books. Also, because stories (both in books and in other media) touch me in a way that few things in this world do, and I wanted to share that feeling with other people. What’s the best thing and the worst thing about being a writer? Worst thing? Having to sit down every day and work on the same thing for years on end, even if I don’t feel like it at that particular moment. Best thing? Getting paid to describe my dreams for a living, and knowing that what I’ve written has changed people’s lives all around the world. A blacksmith, or a professional artist, or a film director. Whatever I ended up doing, I know that I would make things. That’s what I love to do—make things. If you could give one piece of advice to aspiring writers what would it be? Read, read, read, read. Good writers are good readers. Read what you love, but also read things outside of your comfort zone, because you’ll learn more than if you just stick with what you’re familiar with. Write about whatever it is you care about the most. Writing is often difficult, but if you truly care about the subject material, that’ll help you through the rough patches. And it doesn’t matter what your interests are. Just don’t let someone else tell you what you should or shouldn’t write. If you want to compose a twelve-volume epic about singing toasters and flying unicorns … then go for it! There are over six billion people on this planet. Through sheer odds, I guarantee that there are lots of other people out there who like the same things you do, no matter how obscure they might be. Learn everything you can about the language you’re writing in. Grammar is boring, I know, but the better you understand your language, the better you’ll be able to get what’s in your head onto the page and into someone else’s head. Find someone in your life—friend, family member, teacher, librarian, etc.—someone who is a good reader, who likes the sort of thing you’re writing, and who can help edit your work. As painful as editing can be, I guarantee that you’ll learn more from editing than you ever will from just writing. The trick isn’t just to perform (and make no mistake, writing is a performance), the trick is to perform and to consciously evaluate what you’re doing so that you can improve. For example, when singing, it’s sometimes hard to hear if you’ve hit a bad note. That’s why every professional singer goes to a voice coach. Sometimes more than one. Writing is no different. Your trusted readers, your editors, are your voice coaches. Listen to them, and you’ll improve at your craft far faster than you would otherwise. This doesn’t work for every author, but I would also recommend plotting out your stories beforehand. Again, a musical analogy may serve: it’s hard to compose a piece of music while performing it, so first you compose it, and then you can concentrate upon performing it as beautifully as possible. So too with writing. Also, read the book Story by Robert McKee. It’s highly useful when it comes to learning how to understand the underlying structure of stories. If I try to write without knowing where the story is going, I get instant writer’s block. As a corollary to No. 2 – don’t give up. It’s incredibly easy to give up, and there are many, many people in the world who will tell you that you can’t do something. Well, I’m here to tell you that you can, assuming you’re reasonably intelligent and willing to put in the work. Sure, you’re going to get discouraged, and there are going to be days when it seems impossible to finish a book or get it published. That happens to all of us. Even once we’re published. The trick is to keep plugging away and trying to get better. And lastly, try to have fun. You don’t have to have fun every day, but try to have fun more days than you don’t. If you can’t, maybe it’s time to think of a profession in a different line of work. Thank you for reading my books, and I hope you enjoy my future ones even more. 1. Why did you want to be a writer? It happened by accident really. Mum was always writing and telling her own stories and when I’d left home she sent me notes from a writing course she went to. I started writing very short stories for Grampa’s Place which was a radio programme for pre-schoolers. Once you start writing, you get hooked. 2. What’s the best thing about being a writer? Being able to be boss of my own world. It’s also a good thing to be if you’re curious because you always want to know more, you want to find out why and how. I fear that I’m horribly curious. 3. What’s your favourite New Zealand book? That’s a hard one! I love Rocco by Sherryl Jordan, The Changeover by Margaret Mahy, See Ya, Simon by David Hill, The Bridge by Jane Higgins, and I admire and adore Lynley Dodd’s Hairy Maclary books. Marmaduke Duck and the Marmalade Jam by Juliette McIver is another favourite too. I’d better stop . . .
4. What do you love most about New Zealand? I spent a month in London over Christmas and although I greatly enjoyed it, it was wonderful to come home to bright days, green landscapes and space. Yesterday I would have said Wellington’s balmy, beautiful weather, but today there’s a gale force wind again so scrub that. I hugely enjoy being able to go into schools – that’s a real privilege. I love it that the people who write for young adults and children are a friendly and supportive bunch. 5. What book changed your life? I can’t really claim to have a book that changed my life, although possibly getting my first book published did because it made me want to keep going, to make sure that it hadn’t just been a fluke.